Who doesn't know about the Afghanistan’s Mona Lisa?? Yes, I am talking about the beautiful Green eyed Afghanistan Girl. The look of the enigmatic Afghan Girl green-eyed ice, considered the Mona Lisa of Afghanistan, she has truly become the icon of the plight of refugees around the world. Forming part of the famous reportage of Steve McCurry, this photograph was taken at the Nasir Bagh refugee camp in Pakistan in 1984 near the city of Peshawar by Steve McCurry, 1950. He was a Photo journalist for National Geographic and an award winning photo journalist, who was headed there for a service that was to witness the situation of Afghan refugees following the invasion. The girl belonged to the Afghan “Pashtun” tribes. She was near about 12 years old at the time when she reached this refugee camp. McCurry had met her in a makeshift school in the field. She had never seen a camera before in her life and when asked by Steve, she agreed to be clicked. She had lost her parents, they were killed in one of the Soviet attacks. She had managed to reach the camp with her ​​grandmother and brothers. 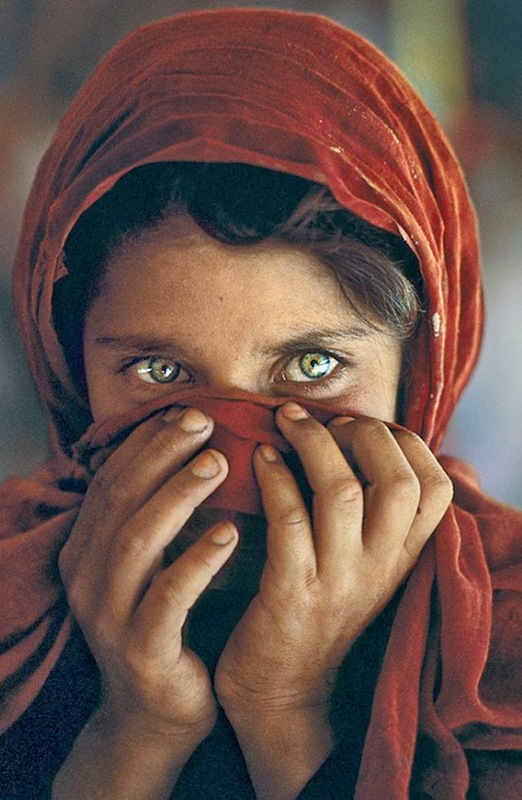 This photograph , known until 2002 as “The Afghan Girl ", was published on the cover of National Geographic Magazine in June 1985. 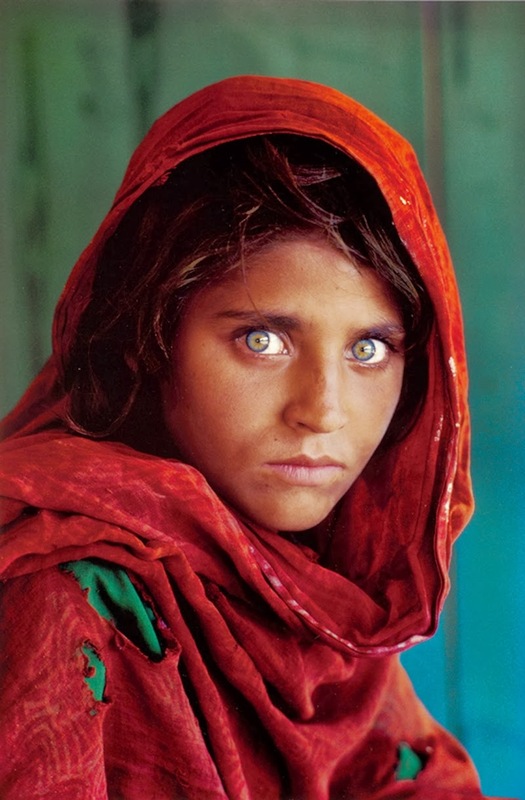 In somewhere around January 2002, the National Geographic organized an expedition of the same McCurry with a team to find and identify the same Afghan girl who had made the Steve one of the most famous photographers in the world. 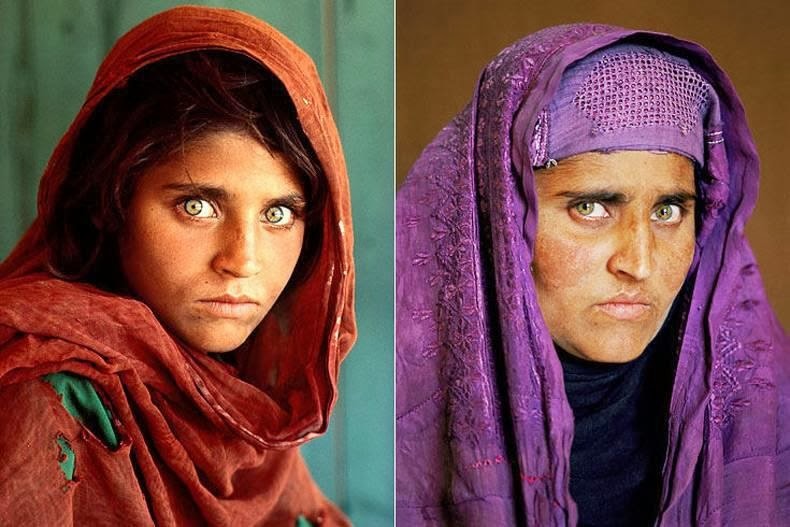 Seventeen years after the famous shot of the "green-eyed girl," the photographer went back with his team at the refugee camp to track the Afghan Girl down. When Steve McCurry returned to the Nasir Bagh camp, he could not find her. Fortunately, after asking few people of her whereabouts and a few false trail, Steve found a man, who was shown the picture of the cover, told Steve that the little girl had lived at the camp as brothers and who had returned to her hometown Afghanistan years ago and lived in the mountains near Tora Bora. 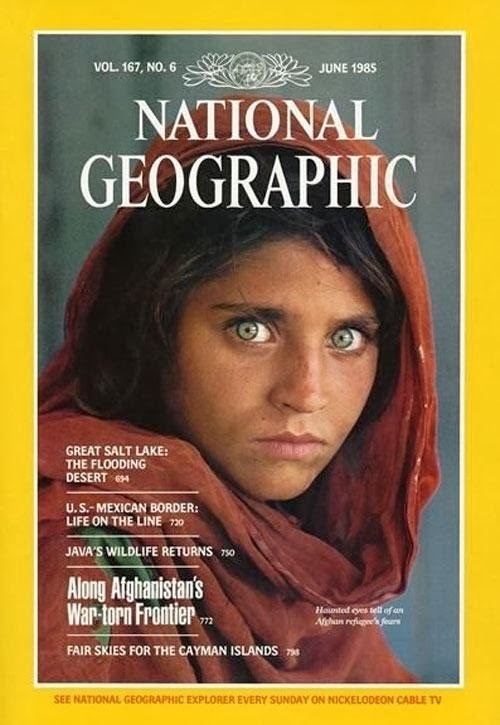 With This research, the National Geographic produced the documentary " Search for the Afghan Girl "aired for the first time on 9 March 2003, in addition to rededicate a front cover to the woman who for 17 years had been unaware of fame conquered the world from its image. The team with great help of Rahimullah Yusufzai, a well known Pakistani journalist who was their guide and interpreter, succeeded after more than 17 years to find the girl, she was now thirty years old and with all the signs of war and difficulties experienced. Her name was Sharbat Gula.